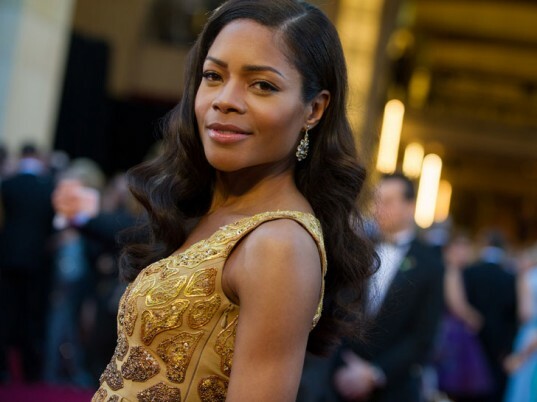 “Bond Girl” Naomie Harris arrived at the 2013 Oscars on Sunday in a daringly slit gown by Ghanian designer Michael Badger, winner of this year’s “Red Carpet Green Dress” challenge. Brought to life by Vivienne Westwood’s atelier and the Royal School of Needlework (the same folks who created the Duchess of Cambridge’s wedding gown, by the by), the Cradle-to-Cradle-certified number featured Global Organic Textile Standard-certified silk crepe de chine, recycled zippers, vintage glass beads, hand-embroidered chocolate-candy-wrapper embellishments, and a pale mustard hue derived from a natural—and supposedly therapeutic—dye bath of goldenrod and chamomile seeds. The British actress succeeded The Artist’s Missi Pyle, who wore the winning 2012 design—a mineral-dyed “peace” silk gown by Valentina Delfino—to the 84th Academy Awards. “My #Oscar dress took 120 hours to make,” Harris tweeted before the show. “My #Oscar dress took 120 hours to make,” Harris tweeted before the show. Cameron’s team also collaborated with the Cradle To Cradle Products Innovation Institute to certify the gown according to its standards of material health, energy, water stewardship, and social responsibility. Another campaign first? The participation of Westwood, a self-proclaimed “climate revolutionary,” as a judge and mentor.